Here is a working 5 Cent Jennings Sweepstake Chief. Needs a Good Cleaning, a little TLC, and probably some new Reel Strips (Available NOS). Prefect for someone that likes to tinker and has the time. $2,350 + Shipping. Please don't ask me what my bottom price is....This is my bottom. Not trying to be rude. This is a fair price for this machine. Please Read This: I have removed the Sweepstake Wiring, and the other Unique Sweepstake Parts from the mech. Now it is just a Standard Sun Chief. New Price is $1,750 + Shipping. Last edited by Swami on Sun May 03, 2015 2:54 pm, edited 2 times in total. As many of you saw, there was a 5 cent Sweepstake Chief on ebay a few weeks ago. It was missing All the Sweepstake Wiring on the mech. It sold for $1,925 + Shipping. The buyer of that machine contact me through ebay to see if I had the parts he needed. I told him, Nobody has those parts and they can only be acquired by stripping them off another Sweepstake Chief. I told him about this machine, and we made a deal. He bought the Wiring, and other unique parts for his mech, which I am removing from the machine I have posted here for sale. 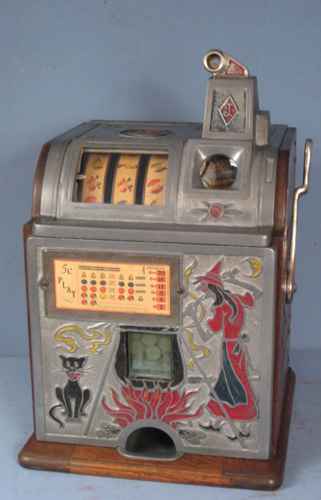 Because of that deal, I am now selling this machine as just a Standard Sun Chief. The new price is $1,750 + Shipping. The Irony of this is, he could have bought one of my Total Correct, Super Nice, All Original Sweepstake Chief's for just a few $$$ more than what he'll be in his machine when it's all finished. Not to mention all the time involved to make the repairs. It's not always about price. You must focus on what you are getting for your money. Sometimes a "Cheaper Machine" is more expensive in the end. Anyway, here's your chance to get a Good Buy on this machine.